People tend to forget that quantum mechanics demands perpetual motion of every atomic constituent. Otherwise, we could locate a particle to arbitrary accuracy. In that case, the universe would be completely different. It would be a completely mechanical universe where Descartes, Liebniz, and Newton would still be kings. The universe without perpetual motion would have materialism for a religion and every last action would be completely determined and predictable. Just a big machine behaving logically. In that universe, the elected president would probably be replaced by a small computer. However, we do live in a universe with perpetual motion. The only place where it theoretically does not exist is at absolute zero temperature, which is unattainable physically. The reader might say in opposition, "Oh, but most of this so-called 'perpetual motion'is just random fluctuations of atoms, etc. which could never be but to work." Well, we have to call your attention to Patent #4,004,210 (as well as #3,890,161) which is a Reversible Thermoelectric Converter With Power Conversion of Energy Fluctuations by Joseph C. Yater from Energy Unlimited, Inc. in Lincoln, MA. Refer to Yater's conference papers and his Physical Review articles . To summarize: RANDOM ENERGY FLUCTUATIONS CAN BE PUT TQ WORK AND THIS DOES NOT VIOLATE THE SECOND LAW OF THERMODYNAMICS. This discussion of the unusual behavior of electrons and permanent magnets raises the following question: Can magnetic motors be designed that use the magnetic energy of the electron's spin? Physicist and electrical engineer, Dr. Harold Aspden, believes there is a theoretical basis for such a belief, stating, "...if we ...operate with variable magnetic flux, then we can hope to draw energy from the intrinsic power sources that sustain the polarization of the ferromagnet" . An inventor, named Howard Johnson, written up in the New York Times under the title, "Motor Run Solely by Magnets", also has a similar conviction . His patented device, a magnetic motor, (#4,151,431) was demonstrated on the basis of linear models which showed unusual rapidity of motion propelling a specially designed, levitating magnet along the length of the track. An analytical, 34-page paper entitled, "The Permanent Magnet Motor" by Willam P. Harrison, Jr. of the Engineering Fundamentals Division of Virginia Polytechnic Institute and State University, Blacksburg, VA, was presented at several conferences and gained attention before the device was fully built. Today, Howard Johnson still is working on perfecting the model. Another inventor, Troy Reed from Reed Magnetic Motor Inc. recently has advertised a magnetic motor for sale . With magnetic injectors, the inventor claims an indefinitely running motor, with moderate torque once the flywheel is started mechanically. A sampling of other patented magnetic motor inventions are referenced for further study . Since magnets which are turned on or off (unshielded and then shielded) can produce large forces on conductors and other magnets, many inventors have persevered, even though a magnetic field is not conservative. In other systems, such as thermal or electrical, we see that a temperature gradient or voltage gradient is enough to make extraction of energy feasible. An example of large-scale thermal gradient users is the 50 kW OTEC (ocean thermal energy conversion) plant off of the coast of Hawaii. We almost take for granted the pattern OTEC exhibits of using most of the 50 kW for generation (pumping water, etc.) 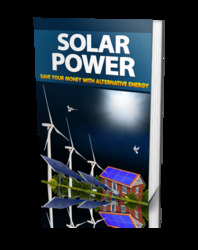 with about 10 kW of "free energy" left over for distribution. Other systems to watch are the high efficiency heat pumps. These inventions with coefficients of performance (COP) of 7 or higher are the conventional free energy sources for the home which today produce heat and hot water, with more heat energy out than the small amount of electricity input used to run the efficient compressor . COP, which is the ratio of output energy over input (with Watts converted to BTU's), is over-unity in most heat pumps. These are templates that can be followed for NCET generators. Concerning magnetism, Maxwell's equations traditionally prohibit magnetic monopoles which could create a "magnetic field gradient". However, Prof. Shinichi Seiki, in his textbook, The Principles of Ultra Relativity; (10th edition), proposes use of the imaginary current usually left out of electromagnetic calculations . He calls it "tachyon energy" (since tachyons also rely upon an imaginary term) and described in detail its use at the First ISONCET, held at the University of Toronto. The mobius coil, which has conductive strips on both sides of a dielectric and a single twist in the loop, is theoretically capable of conducting an imaginary current if we allow the magnetic intensity, H, to have an imaginary component . Roles of electricity and magnetism become reversed in the derivation and the mobius coil is found to produce an equivalent imaginary magnetic "charge" or monopole. As speculative as this may seem, Prof. Seiki has built up a textbook filled with his self-consistent theory. He describes many mobius generators which have anomalous electrical properties, such as steadily building up voftage over a period of weeks, or melting a stone with what looks like a high voltage arc produced from his low voltage circuit. In a recent correspondence, Prof. Seike mentions that he is now selling the basic components for researchers to duplicate his anti-gravity experiment involving a transistorized coil, detailed in his textbook. A price list for the four parts is available from him upon request. A simple, reversible magnetic motor, is the homopolar or "Faraday" generator. Discovered by Michael Faraday back in 1831, its unusual operation has eluded complete scientific explanation . Interested readers are referred to the conference article, "The One-Piece Faraday Generator, Research Results" by this author. 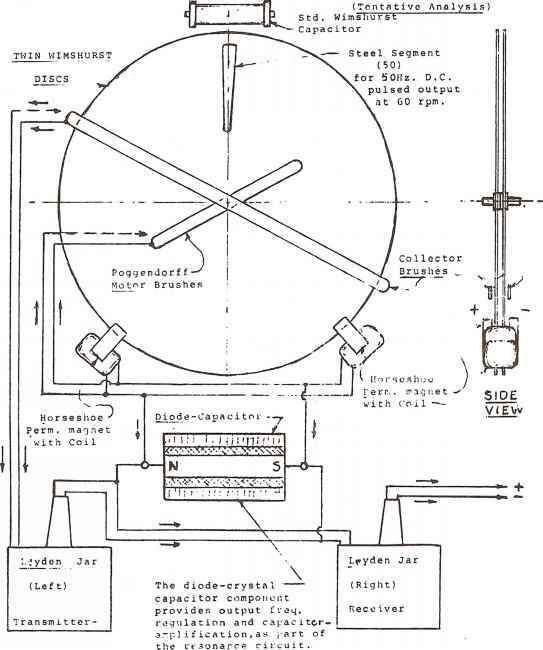 Analyzing the Hendershot and Moray devices, Paul Brown has taken them further by producing a 5 kW nuclear battery that lasts, based upon a beta emitter with a resonant circuit. Nucell, Inc. also has a small consumer battery which is the first NCET device ready for mass market . He was a speaker at ITS 1990 .